We often use scenarios such as this to test the individual components and entities of CRM in an integrated fashion. 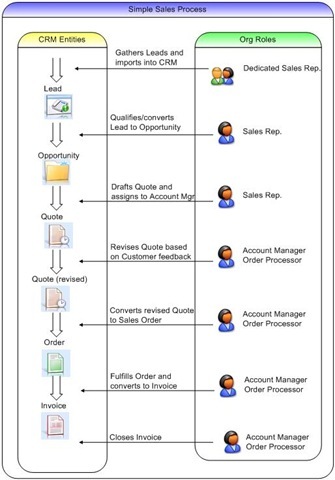 This is one example of a very simple sales scenario describing the flow of user actions in the Sales module of CRM. The flow chart below summarizes the walk-through text. David is a dedicated sales representative and has just attended a trade show where he collected a large number of leads. He’s organized these into an Excel spreadsheet and uses CRM’s Bulk Import feature to quickly import these into CRM as Leads. CRM’s Duplicate Detection works to reduce any duplicate records. He also checks to see if any other salespeople are working with the existing customer(s). Based on communications with a new Lead, David qualifies the Lead into an Opportunity with an existing Account. He sets the Price List for the Opportunity to enable him to draft a Quote to sell 100 bicycles to the customer. He collects information about Competitors and adds this to the Opportunity record for tracking. He sends Sales Literature information to the customer via e-mail to see if they are interested in other similar products. With the basics established for this customer relationship, David assigns the Opportunity and Quote to an Account Manager, Michael. Michael continues working on the Quote with David’s help, along with Kevin, the Sales Manager. He uses CRM’s multi-currency functionality to establish pricing based on the current Exchange Rate, and maximizes the mark-up by modifying pricing on the Quote. When he’s completed with the Quote, he hands it off to the Order Processor, Susan. She verifies the pricing, mark-ups, and checks for accuracy before printing it for the customer via Mail Merge and faxing it to the customer. After reviewing the proposed Quote, the customer requests that additional parts be added to the Quote and some others be removed. Michael revises the Active Quote to make the necessary adjustments and the revised quote is re-routed past Susan who takes the necessary steps to verify the changes, get them approved, printed and faxed back to the customer. The customer is satisfied with the revised Quote and decides to go ahead with placing an order. Michael converts the revised Quote to a Sales Order record and a Workflow rule alerts Susan about the Order which needs to be fulfilled. She uses an ERP system to pull together the items needed to fulfill the Order. Susan closes the Order as Fulfilled and creates an Invoice from the Order. She sends the Invoice to the customer along with the bicycle parts the customer ordered. The customer then pays the amount billed in the Invoice. When Susan receives the payment from the customer, she closes the Invoice as Paid (complete).